The Giga-tronics 8650A Series Universal Power Meters have the extensive measurement capabilities and features you need to test today sophisticated communications systems faster, easier and more accurately. The 8650A can measure the CW power, peak power and average power of TDMA, GSM, and CDMA (both IS-95 and third-generation 10 MHz wide band) signals. 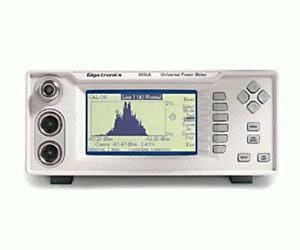 CW measurement speeds (readings/second) over GPIB are >1,750 and modulated measurement speeds are >300. And the meter includes many time saving features such as automatic time gate setting, direct crest factor measurement, and statistical power measurement analysis.